In the last year or two, there has been a lot of work by start-ups in the videoconferencing field. And these start-ups often portray themselves as disrupting the business of established players in their chosen field. In videoconferencing, that established player is Polycom. Best known for the flat tabletop phones that tend to show up in office conference rooms all over the world, it is also a huge player in the business of videoconferencing. Today, Polycom, which last year reported $1.5 billion in sales, roared back. Videoconferencing is a complicated business. On one hand, there are high-end equipment vendors like Polycom and Cisco Systems, which provide the gear used on either end of a video conversation, known as “endpoints,” and also the back-end gear that carries the videoconference streams. What has changed the map in recent years is the onset of cheaper, lower-end Webcams, embedded into PCs, smartphones and tablets, that can get the job of videoconferencing done in a “good enough” manner. By and large, these systems tend to be incompatible with each other. The classic comparison is the early days of the telephone, when one phone company’s network didn’t interconnect with that of others, creating a situation where photographs from that area sometimes show businessmen with several phones on their desks. The big target over the last few years has been making these systems interoperable, by creating a sort of polyglot videoconferencing system that let anyone using one type of system talk to anyone else using another. That’s what Polycom is aiming to do with what it has portrayed as the most significant series of announcements in the company’s history. The major piece of the news is RealPresence CloudAxis Suite, which it says extends video collaboration to anyone using video chat services like Microsoft’s Skype, Facebook, Google Talk and others, all via a browser. Polycom benefited in part by concessions made by Cisco Systems to regulators in the European Union when that company acquired Tandberg in 2010. Cisco spun off its ownership of a technology called TIP, or telepresence interoperability protocol. On top of that, it is taking a videoconferencing standard known as Scalable Video Coding (SVC) in its platform, and providing its implementation of SVC to other companies in the industry. It has also opened up the platform to programmers via the creation of a series of APIs that will let software developers build on top of it. Finally, Polycom announced a bunch of new hardware — big collaboration systems that combine HD video displays with embedded cameras — and also software that runs on PCs, phones and tablets, all boasting a new user interface. The start-ups in the space are trying to steal what thunder they can from Polycom. Blue Jeans, which over the summer raised $25 million from New Enterprise Associates, is one that attacks the interoperability problem via a transcoding service that runs in the cloud. Today, Blue Jeans said it had taken away about $15 million worth of sales from both Polycom and Cisco, which may indeed be true, but would amount to fractions of a percentage of their revenue. Vidyo is another video start-up that uses an on-premise router that constantly monitors the conditions of the underlying network, and adapts the video stream as those conditions change. 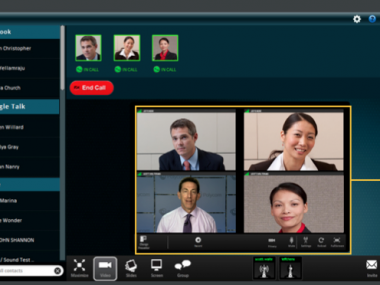 Vidyo’s technology is what Google uses for its consumer video chat service, Google Hangout. Earlier this year, some analysts suggested that Vidyo’s success had a little bit to do with a slowdown that Polycom was seeing at the time. So, if you see a lot of confusing claims and counterclaims about videoconferencing technology today, you know why. I did promise you, a little more than a year ago, that this business was about to get interesting. And so it has.